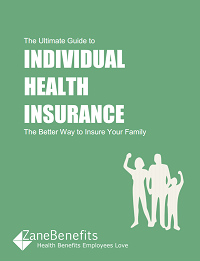 Zane Benefits, the #1 online health benefits solution, announced today the publication of a free eBook "The Ultimate Guide to Individual Health Insurance - The Better Way to Insure Your Family." The new eBook helps employees and employers understand new advantages of individual health insurance. According to Zane Benefits, traditional employer health insurance is broken. The solution for employers and employees is individual health insurance. With individual health insurance, employees pick the plan that best fits their needs, can keep the same plan for as long as they want, and save money with new healthcare subsidies. Employers can continue to cover employees' healthcare costs with a monthly healthcare allowance, and save on the cost of healthcare. Employees, small businesses, HR managers, and CEOs should download this guide to learn how to take control of their healthcare.